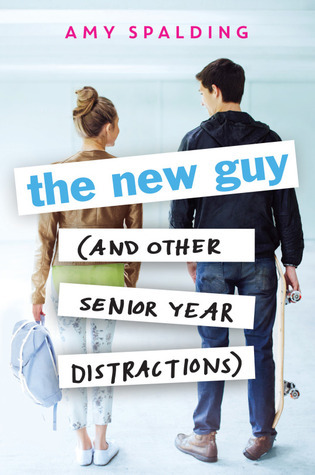 A cute read, with interesting characters, and a high school setting that is very ambitious, The New Guy offers a fun and quick read perfect to make you smile. While it isn't a perfect book, and there were areas that frustrated me, I still finished it in record time with a smile on my face. It is senior year and Jules has big plans. Most importantly, gaining the editor position for the school newspaper, The Crest. She is an overachiever to the max, and absolutely Type-A, but that is just fine with her. She doesn't need distractions this year, she just needs to focus on getting into the best school possible. But when Jules meets the new student in school, a former boy-bander named Alex and he starts showing up at her locker and lunch table and flirting with her, she starts to wonder if maybe a little distraction wouldn't be too bad. Then she hears about a new online news program, with her nemesis at the helm, and something that seems a lot like betrayal occurs, Jules will stop at nothing to save The Crest. Even if it means losing the one guy she thought might be her perfect distraction. Jules is a character that I could see making people angry, but I personally adored her. Yes, she did things that drove me crazy and even made me angry, but you can easily see that she means to do the right thing. She isn't used to a guy being in her life, or having something that she loves and has worked hard for, threatened and she makes some bad decisions. But in the end, she owns up to that and does everything she can to make it right. Alex was a good love interest, but a little underdeveloped for my taste. Their romance was sweet, but I wish there was a little more oomph behind it. One of the great things about this book was the very real depiction of friendships in high school, especially during senior year. Jules best friend starts to feel left out, and ignored, with very good reasons. I loved this plot line in the story, and I love the way it was resolved. The characters definitely make this story. The only real complaint that I have is not even really a complaint. The writing felt a little more juvenile than most YA contemps I encounter these days. But that in itself isn't a bad thing. It is definitely more to do with my less than YA age. For the most part, this story is sweet and a good lesson in what it means to start growing up. Great review! I did like Jules even though sometimes I just wanted to shake her and remind her to be a good friend! Her moms were the best and I didn't mind that it was a bit more juvenile -- it felt truer to me!